“Hulagway sa Kinabuhi is a weekly photo meme that is inspired by our native tongue Bisaya. 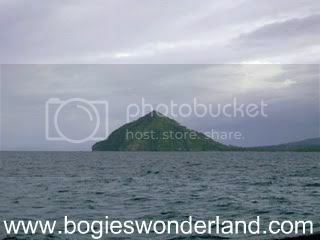 “Isla” in Bisaya means “Island“, a piece of land that is surrounded by water. I took this photo a year ago during my travel to Camiguin Island. This island or “isla” is famous because of its white beaches, rich diving sites, water falls, hot springs, cold springs and many others. Usa ra mi ka oras gikan sa amoa to Camiguin by boat heheh. Bisitahi unya ko. kanindot sa isla sa camiguin..
What a beautiful photo. I would love that on a wall, in my home. It is striking.